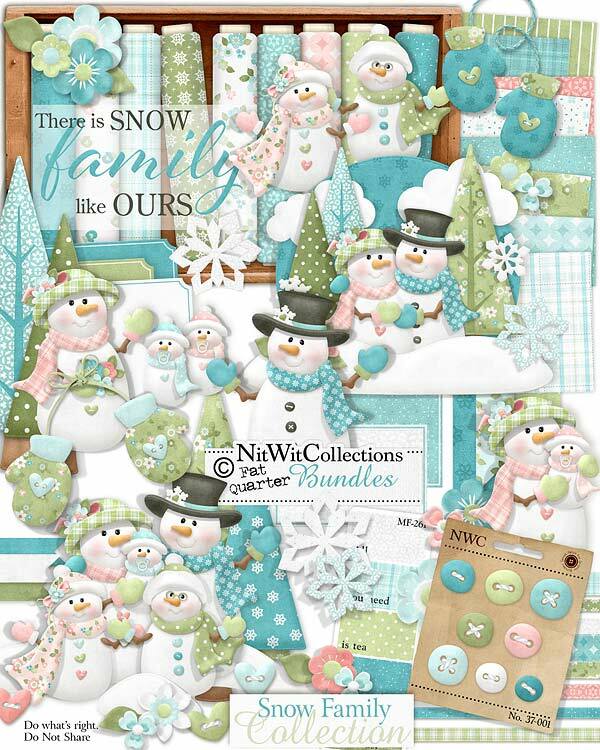 FQB "Snow Family" Collection is a perfect digital kit for your family photos! Whether it be your most recent Christmas family portrait, a family vacation or outing, or just individual pictures of each of them this Collection provides the perfect elements and digital papers to create fun loving digital scrapbooking layouts and cards with. Playing and fun spirited family time are what it's all about, isn't it?? 3 Button hearts...who can resist using these sweet elements?? 3 Journal cards....see how we chose to use one of these in our card making idea above! 1 Scene with the snow "Mom & Dad"...possibly out for date nite??? 1 Sentiment "There is Snow Family like Ours"
4 Snowbanks...some big, some small...but we don't have to shovel them at all! 1 Snow family....one big happy family! 1 Snow girl ready for any event!